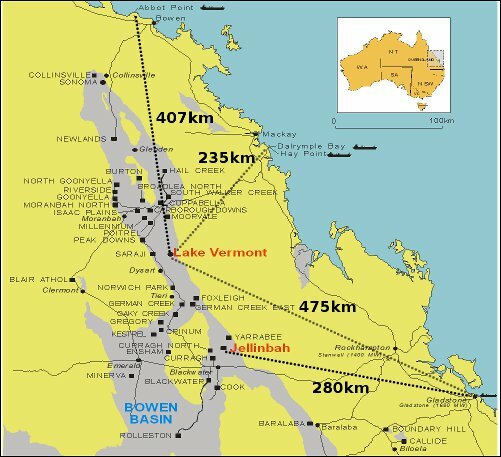 Established in 1988, Jellinbah Group is a privately owned independent Queensland based coal company with operations in Central Queensland’s Bowen Basin. The group has two operating mines, Jellinbah Mine and Lake Vermont Mine, with a combined production capacity of 14Mtpa. The mines primarily produce metallurgical coals used in the steel making process including hard coking coal, low volatile PCI coal and some limited thermal coal. Jellinbah Mine is located on the Tropic of Capricorn, near Bluff and the product coal is hauled by rail to the Port of Gladstone, approximately 300 km from the mine. The mine has been in operation since 1989. It is an open cut operation with overburden drilling and blasting, followed by conventional removal with truck and shovel and dozer push. Jellinbah Coal is a low volatile bituminous coal with high specific energy, low ash and sulphur. With these properties it is ideally suited to pulverised coal injection and special coal boilers. The mine has a current production capacity of approximately 5Mtpa. Jellinbah Group has a 70% interest in the Jellinbah operation and Marubeni Coal and Sojitz Coal each hold 15% interests. Lake Vermont Mine is located near Dysart and product coal is hauled by rail to the Port of Gladstone and Dalrymple Bay Coal Terminal. Lake Vermont’s first shipment was in February 2009. Jellinbah Group appointed Thiess Mining as the operators of the Lake Vermont mine. The mine is an open cut operation, with overburden drilling and blasting followed by conventional removal with truck and shovel and dozer push. Lake Vermont produces hard coking coal, low volatile PCI coal and thermal coal. The mine infrastructure was expanded in 2012/13 and from October 2013 has been operating has a production capacity of 9Mtpa. Jellinbah Group has a 70% interest in the mine, with Marubeni Coal, Sojitz Coal and AMCI each holding 10% interests.